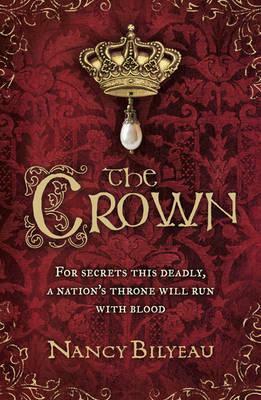 First off, a huge thank you to Orion Books for sending me The Crown in exchange for an honest review. Not only that, but they’re very generously giving away copies to three lucky readers at Booking in Heels! UK only, I’m afraid but click here to enter. It’s a beautiful, very intelligent book that would be a great addition to anybody’s historical fiction collection. London, May 1537: When Joanna Stafford, a young novice, learns her cousin is about to be burned at the stake for rebelling against Henry VIII, she makes a decision that will change not only her life but quite possibly, the fate of a nation. Joanna breaks the sacred rule of enclosure and runs away from Dartford Priory, but when Joanna and her father are arrested and sent to the Tower of London, she finds herself a pawn in a deadly power struggle. Those closest to the throne are locked in a fierce fight against those desperate to save England’s monasteries from destruction. Charged with a mission to find a hidden relic believed to possess a mystical power that has slain three Englishmen of royal blood in the last 300 years, Joanna and a troubled young friar, Brother Edmund, must seek answers across England. Once she learns the true secret of her quest, one that traces all the way back to Golgotha and the Relics of the Passion, Joanna must finally determine who to trust and how far she is willing to go to protect her life, her family and everything she holds dear. The press release that accompanied my copy described The Crown as a cross between Dan Brown and Philippa Gregory. I was slightly dubious at first because I’ve seen many, many books profess Brown-esque similarities but this actually is. The plot revolves around a search for a missing religious relic but set in Tudor England and written in a beautifully elegant historical style. It really is the best of both worlds. I love Britain in the 1500s and I love biblical archaeology, so this was the perfect blend for me. Joanna Bulmer, a young novice at Dartford Priory, is blackmailed into locating an ancient artefact by Bishop Gardiner – if she does not, Henry VIII will succeed in closing every monastery and priory in England. I’m not really that familiar with the Bible, but I was still captivated by her struggle to protect her Sisters and her faith. The prose is beautiful. It flows like a well-crafted story but still emanates intelligence and elegance. It’s very formal, as befitting the story of a young Tudor nun. Nothing irritates me more than Tudor princesses using the slang of today, but The Crown steers as far away from that as it’s possible to be. Nothing but authenticity here, thank you very much! Whilst it’s definitely heavier on the description than the action, it never felt like a slog. Instead I was captivated by the attention to detail and atmosphere present throughout. I liked Joanna as a character. She is clearly a pious and devoted young novice who believes strongly in her faith, but somehow manages never to come across as preachy and never irritated me, and trust me – I irritate easily. Instead, her struggles between obedience towards her prioress and the desire to do what is right is obvious and I sympathised. I liked the way her Spanish background was brought in to explain the sympathy she felt for Katherine of Aragon and her faith. Ms Bilyeau has clearly done her research. The novel is filled with minor Tudor personages and historical references, as well as a clear understanding of the Dominican order. I like to think I’m reasonably well versed in the history of this period, and yet even I had to dash off to Wikipedia a good few times. I learned a lot, although it did make the plot occasionally a little hard to follow when I wasn’t really sure who a character was meant to be. When a burning is announced, the taverns of Smithfield order extra barrels of ale, but when the person to be executed is a woman and one of noble birth, the ale comes by the cartload. I will admit that the ending bothered me a little. It just seemed to kind of fizzle out a little and I didn’t really see the relevance of certain (very minor) subplots right at the finish. The romance (if it could be called that) seemed to spring from nowhere and the whole issue with Joanna’s father was a little surprising. However I can’t say those really detracted from my enjoyment of The Crown. Long story short, this is the best piece of historical fiction I’ve read in a long time. I’d thought I was burned out from all the Tudor fiction I’ve read, but perhaps The Crown was just what I needed to bounce back! You may also be interested in Nancy Bilyeau’s website, or click here to see The Crown on Amazon. It was definitely a different take on the Tudor era. I loved seeing everything that was going on from a different perspective!